Sheboygan Falls, Wisconsin – August 7, 2018 – Following contact with another car early in Race 1, James Roe Jr. endured a challenging weekend at the 18 turn, 2.8 mile Pittsburgh International Race Complex. Roe Jr. was able to salvage a Top 5 finish in Race 2 while experiencing issues. With only limited time to learn the course and chasing car set-up, Roe Jr. qualified a solid 5th. In Race 1, Roe Jr. got off to a good start quickly moving forward in the field. On Lap 1, while challenging for 3rd place, Roe Jr. made a move to the inside of Turn 1 resulting in contact with another car. The contact caused a right rear puncture and suspension damage that ultimately required the car to be retired on Lap 5 resulting in a DNF. The ArmsUp team went to work following the contact in Race 1 and redialed the car in for Race 2. During qualifying for Race 2, Roe Jr. was still not completely satisfied but was able to qualify P6. On Lap 1 of Race 2, Roe Jr. made a pass for P5. Following some 1st lap action the running order at the front of the field settled in and remained largely unchanged for the remainder of the race. Roe Jr. finished in 5th. 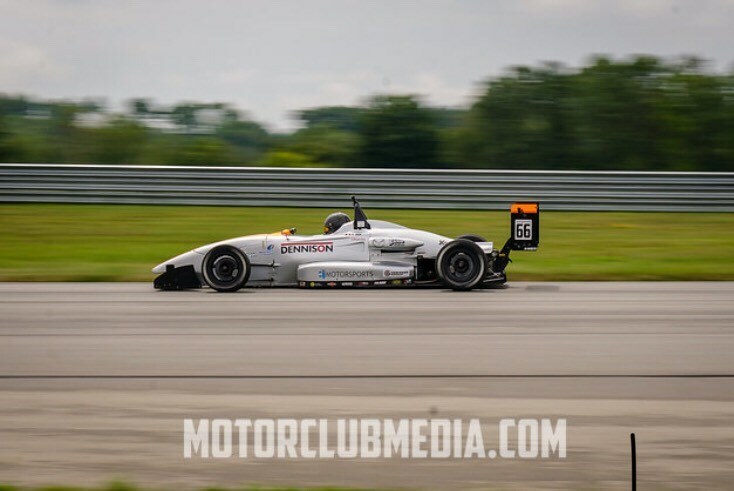 Rounds 11 and 12 of the F2000 Championship are August 24th – 26th at Summit Point Motorsports Park. Keep up to date with James Jr.
Based Sheboygan Falls, Wisconsin, ArmsUp Motorsports was established in 1995 by twenty year lead instructor for Skip Barber Racing School, Gregg Borland. It has since then grown to be a leading team in the world of motorsports. ArmsUp Motorsports is a full service prep facility with a team of highly experienced mechanics, driving coaches, and engineers readily available to assist in the success of each driver. The team specializes in Pro F2000, Formula Continental, Formula Atlantic, and Vintage Car racing.